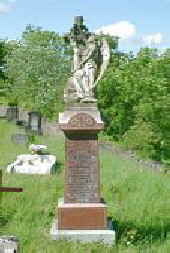 This is the Roderick family memorial at St Cynon’s Cemetery, Llanfabon, Nelson. Rees’ father was also Rees Roderick. He died on 7th April, 1920 and was 69 yrs old. His mother was called Esther (born Drew) and she died on 1st July 1937 aged 81 yrs. Gwenllian was married to a Captain Henry G Alldridge who died on 21st May 1929 aged 55yrs. Capt Alldridge is interred at Oporto, Portugal. Census reports show that the above named were not the only children of Rees and Esther. Sarah Wright and Oliver Broadstock were shown as servants.